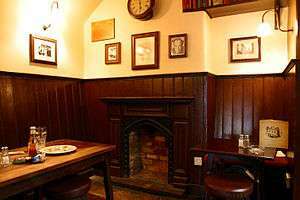 A corner of the pub, formerly the landlord's sitting-room where the Inklings met. There is a small display of memorabilia. The Inklings was an informal literary discussion group associated with the University of Oxford, England, for nearly two decades between the early 1930s and late 1949. The Inklings were literary enthusiasts who praised the value of narrative in fiction and encouraged the writing of fantasy. The Marion E. Wade Center, located at Wheaton College, Illinois is devoted to the work of seven British authors including four Inklings and Dorothy L. Sayers. Overall, the Wade Center has more than 11,000 volumes including first editions and critical works. Other holdings on the seven foremost authors (G. K. Chesterton, George MacDonald, and Inklings Owen Barfield, C. S. Lewis, J. R. R. Tolkien, and Charles Williams) include letters, manuscripts, audio and video tapes, artwork, dissertations, periodicals, photographs, and related materials. The members of the Inklings are the three Caretakers of the Imaginarium Geographica in James A. Owen's series, The Chronicles of the Imaginarium Geographica. The existence and founding of the organization is also alluded to, in the third novel, The Indigo King. "There goes C. S. Lewis", said Fen suddenly. "It must be Tuesday." Charles looked bashful. "I have heard, he said carefully, that there is a pub in Oxford at which C. S Lewis often takes lunch." "There is indeed,", said Peter. "But he lunches with a group of cronies … Right, on with our overcoats and it's off to the Bird and Babe." ↑ Kilby & Mead 1982, p. 230. ↑ Edwards, Bruce L, CS Lewis: Apologist, philosopher, and theologian . ↑ "War of Words over World's Worst Writer", Culture Northern Ireland . ↑ Tolkien, John Ronald Reuel (2006), The Letters of JRR Tolkien, London: Harper Collins, p. 388 letter #298, ISBN 978-0-261-10265-1 . 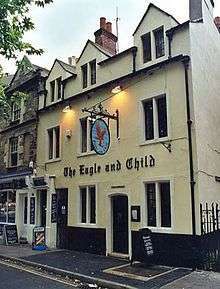 ↑ "Eagle & Child pub", Headington, UK . ↑ Inklings (literary and art magazine), Miami University . Knight, Gareth (Oct 2010), The Magical World of the Inklings, Barfield, Owen, foreword (new & expanded ed. ), Skylight, ISBN 978-1-908011-01-5 .